You have been dreaming and planning and saving for the wedding of your dreams. 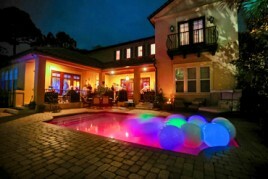 Now it’s time to relax in the one aspect that will make your party memorable – the entertainment. At B-Boy Productions, your party is not just another event on the calendar for us. We’re looking to create the wow factor that results in the “oohs and aahs” from your guests. We take great care to capture the musical soundtrack that best represents who you are and keeps you and your guests singing along, dancing the night away. 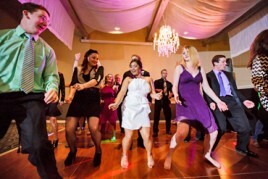 Plus, we have a ton of enhancement options to truly set your event apart. From your initial planning consultation, straight through to the day of your party, our highly skilled entertainment experts, DJs and polished MCs listen carefully to your vision, and then execute a flawless party that is guaranteed to exceed expectations! You take center stage and are our priority from the moment you reach out to us, as it should be. 2015 Couple's Choice award winner from WeddingWire. Trusted by high-profile companies nationwide. 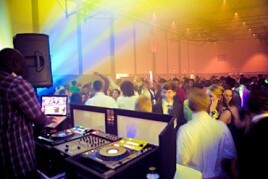 The latest music and superior quality event lighting. Go-to entertainers for milestone occasions and other events. Communicate with your Wedding DJ anytime, however you like. You can chat with us on this screen, text, call, e-mail or fax (just kidding on the fax). Our customizable client portal takes away any and all worries. We’ve designed it for you to decide (or leave up to us) exactly how the night will flow with the music and festivities. We have back-up equipment, back up DJs, back-up everything. You want to be able to let go and enjoy your special day. We’ve got you double covered. We’ve spent years fine-tuning what we offer into a competitive and affordable all-inclusive, one-stop shop entertainment solution or you can select off an a-la-carte menu of offerings to fit and maximize your budget. We are not only in the memory making business! Preserve those once-in-a-lifetime moments with a photographer, videographer or photo booth – or all three! Josh B. was absolutely top notch. Bottom line, he's a great DJ. Aside from terrific music, gear and skills, he has a very good feel for the kind of music/atmosphere to connect with an audience. Regardless of the event, you will enjoy Josh's enthusiasm and energy. Words cannot describe the amazing customer service, from our initial booking phone call all the way to our wedding day. DJ Rhoda and Josh Weck were absolutely AMAZING! They are both so talented and truly care about their work ... and talk about the song mashups! We recommend B-Boy Productions and 100% recommend Josh and Rhoda. Truly the dynamic duo!! Thank you B-Boy Productions for providing outstanding service at our wedding this weekend. DJ Dan was our DJ and he kept us moving on the floor. Dan felt more like a friend than our DJ, and after chatting with him for almost a year, we were so honored to have him hosting our reception! Josh and Brian were SO great to work with. Josh was the DJ at our wedding and reception and I do not have one negative thing to say. He was prepared, he was engaged, and he was SO energetic. I didn't want the reception to end. BOOK THEM. You won't regret it. We wanted a party, and they brought a party! Our wedding planner recommended DJ Brian B to us, and we couldn't have been happier. What we most loved about Brian was that he didn't just create a playlist and press play. We were worried about getting our guests on the dance floor, but he did a great job getting everyone engaged, and we danced the night away. He made the night fly and we weren't ready to go when the venue started kicking us out. Great job Brian and thank you! 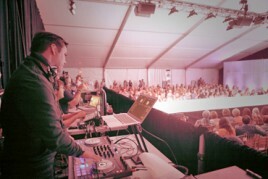 DJ Shawn Frady was phenomenal and kept the party going. He did an awesome job reading the crowd and playing songs that would keep the dance floor full. Everyone keeps talking about how wonderful our DJs were! Irving Gil also did a fantastic job as our officiant. We also rented a photo booth from them, which was a huge hit. All in all, our wedding was a HUGE success and I know we owe a lot of that to B-Boy Productions. We definitely recommend them to anyone!